What are the odds of a Super Smash Bros. Ultimate Global Testfire demo? Will we get a Super Smash Bros. Ultimate Global Testfire demo? Short answer: it doesn't currently look like it. 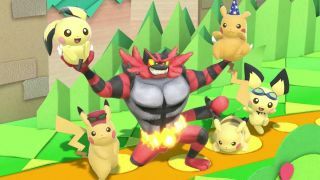 While there's been no official confirmation of a limited-time online demo, Nintendo hasn't shut the notion down outright just yet, and there's still time before launch for something to come together. Even though we've already seen the final Nintendo Direct devoted entirely to Super Smash Bros. Ultimate - which made no mention of a demo - those servers will need to be primed and ready for the onslaught of players come launch day. During San Diego Comic-Con, IGN asked Nintendo's Bill Trinen about the possibility of a Global Testfire demo for Ultimate. Trinen's quasi-answer was predictably coy: "Right now they're focused very much on getting the game ready, but we have a few other things to be talking about down the road between now and when it launches in December." Granted, this was back in July, so those "other things" could just as well be the new characters or gameplay additions like the recently unveiled Spirits mode. It's possible that Super Smash Bros. Ultimate could go the way of Mario Tennis Aces, which had a limited-time online tournament demo as its pre-launch testing ground. Perhaps it'll follow in the footsteps of the Mario Kart 8 Test Drive, where the racing game was playable at select GameStop locations - though that wouldn't be of much use to the Smash Bros. server testing. There's precedent for a Global Testfire / Testpunch being announced just a few days before it goes live, which is what happened with Arms. But we'll just have to wait and see what Nintendo decides to do - and I wouldn't get your hopes up too high unless a surprise Direct gets announced before December rolls around. For now, it's a waiting game to see if a demo comes together, but we'll keep our fingers crossed, and will be sure to update this story if anything changes. While you wait to play Super Smash Bros. Ultimate, why not pass the time by playing one of the best Nintendo Switch games?